If you’re looking for the best flea and tick medicine for dogs and have little time at your disposal, this is where you will find the information you seek. After comparing the most recommended products on the market, regarding results, pricing, and safety for your pet, Dr. Fox concluded that you should purchase the Frontline Plus Flea and Tick Control for your furry friend. This complete formula treats against fleas, flea eggs, lice and tick. The provided doses will make sure your dog won’t be bothered by such critters for three months. It is easy to deliver the treatment, and it won’t cause your dog any discomfort. Should the Frontline Plus Flea and Tick Control not be available, consider the Bayer Advantage II instead. This product has proven to be extremely effective against both the critters themselves as well as their eggs or larvae. This means you don’t have to worry about the future generation of fleas, ticks or lice. After administering the product, it only takes 24 hours to dispose of the unwanted critters in the pet’s fur. The process doesn’t cause any harm. Some online purchased products are reported not to have the advertised effect. Customers received fake products. 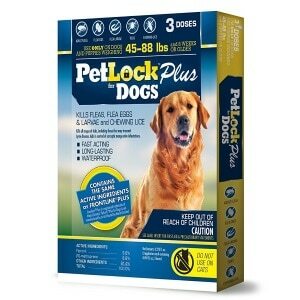 If your dog need to get rid of fleas and other parasites and has over 2 months old, this is the right product. The Bayer Advantage II is waterproof. Therefore you can wash your pet without fearing that you may wash off the product as well, or affect its potency. In order for this product to work the fleas do not have to bite your pet, as opposed to other products. The instructions are clear and the application procedure is simple. The substance is powerful enough. If the quantity applied is not exactly measured, your pet risks getting bald patches or even burns on their skin, so take great care. Use it on puppies that are older than 7 weeks, and all the fleas will die and your dog will be healthy again. This substance is capable of decimating fleas, lice, and even mosquitoes in order to keep your pet safe and healthy. The product destroys the critters in all of their life forms, preventing future parasites from developing after the potency wears off. Once 12 hours have passed from the product administration, all parasites are dead. This product works by paralyzing the pests’ nervous system. However, sometimes it can affect the dog as well. This product works fast and eliminates all types of parasites from your pet’s fur without too much trouble. When looking for good flea medicine, don’t hesitate to look at what products this company has to offer, as it has an outstanding reputation among pet owners for their high-quality supplies. 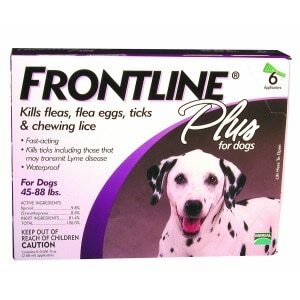 The Frontline Plus Flea and Tick Control is recommended for dogs weighing 45-88 pounds and are older than two months. Its action is guaranteed not only against adult critters, but it deals just as well with eggs and larvae, so you don’t have to worry about new generations of flea, lice, and tick growing inside the fur of your pet. Its fact action is another great plus, as it takes less than 24 hours to kill all the fleas living in your furry friend’s coat after administering the first dose. The way it is applied is easy, and it causes no discomfort to your dog. The 3 provided doses protect for about 3 months, so you won’t have to renew the treatment very often. Your dog will be happy, and your family will be safe from diseases that can be transmitted by fleas and tick, as well. This is a topical solution that guarantees to break the developing cycle of fleas, so that no new population appears, causing your dog discomfort and putting its health in danger, as well as your family’s. You can use it when treating dogs and puppies that are at least 7 weeks old. This flea killer for dogs will help your dog get rid of nasty sensations like itching all the time. When the dog scratches itself, it causes irritations and wounds to appear on its skin, and that can lead to further complications. The topical solution presented here will make sure that fleas will be killed and stopped from causing harm. The solution is waterproof, which means that you can still wash your dog, as usual, without fearing that you will affect the potency of the treatment against fleas in any way. Remember to treat the pets that stay indoors, too, if you have others that can bring fleas home from their daily walks. 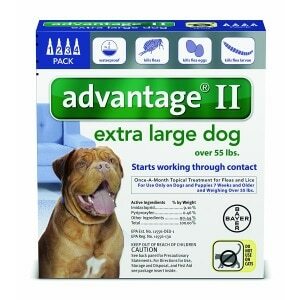 The Bayer K9 Advantix II is capable of killing fleas, ticks, and even mosquitoes, so it is a complete solution against the critters that may annoy your pet and make it ill. One great thing about this product is that it can kill the critters in all their life stages, preventing new populations from appearing and infesting your home. Dogs and puppies that are at least 7 weeks old can be treated with this solution. It is a product meant for dogs of smaller weight, 4 to 10 pounds, so this is indicated for smaller breeds. Besides fleas and ticks that are the most dangerous, the product prevents lice and even repels flies. From the time of applying the treatment, in 12 hours all the critters living in the dog’s coat will die, and the solution will continue to be active for an entire month. 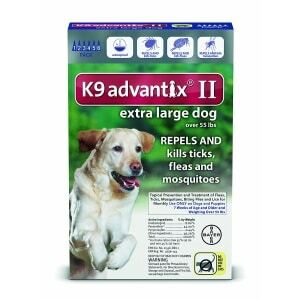 The great thing is that the Bayer K9 Advantix II can be used as a prevention product since it repels ticks and flies that are known to carry flea eggs with them. This treatment is recommended for dog-use only, which means that you should not, by any means, use it on other pets. One of the greatest things about the PetLock Plus Dog Flea Treatment is that it can kill fleas in all their life stages, so it breaks their development cycle. That means that even eggs and larvae will be killed, preventing them from developing into mature critters. Besides dealing very well with fleas, this solution is ideal against lice and ticks, as well. 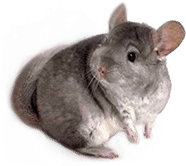 The treatment takes little time to start killing fleas, and even after eliminating the living critters in the pet’s coat, it will continue to be active so that no new generations of fleas appear. It is paramount to treat your dog against such pests on a regular basis. Even if your dog is the cleanest pet possible, and you’re religious about giving it baths and grooming it, fleas, lice, and ticks will still appear in its coat, only by taking it outside for walks in the park. 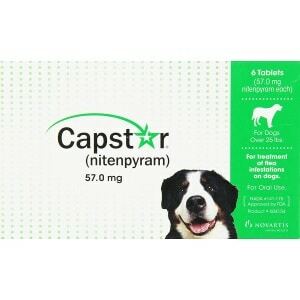 The oral flea medication reviews recommend the Novartis Capstar Flea Tablets, as being among the medicines against fleas that work. This one is not intended for dogs only, and it can be used for cats, as well. As a general rule, these tablets should be used for dogs weighing more than 25 pounds. After administering the first dose, the flea nestling in your dog’s coat will be killed in the next 4 hours. For cats, it may take a bit longer, around 6 hours. A box contains 6 tablets, and you can give your dog or your cat another dose every day until they get rid of fleas completely. This fast acting medicine begins to work as soon as half an hour after administering the first dose. That means that you will be able to offer your pet the relief it needs after having to deal with biting fleas and itchiness all over. Also, some pet owners prefer oral treatments over topical ones. Is your dog scratching all the time and you suspect it might have fleas? Do you take your furry friend for long walks in the park, and you are worried that ticks might have infested its beautiful coat? There are solutions for everything, and getting the right treatment is important. This guide will teach you about the various products for treating dogs against such critters. One of the most important things about the medicine you can get for your dog to treat it against these nasty critters is to be efficient in all stages of development. Fleas lay eggs in the dog’s thick coat, and these eggs hatch, giving life to larvae that only later mature. Even if you buy a potent treatment that will kill off the adult fleas, your dog will still have to deal with the new generations that will hatch and begin biting just as savagely as their parents. That is why it’s so important to get medicine and treatment that works for eggs and larvae, too. Always read the instructions and the description of the product carefully. This will tell you all about what kind of action it has, and if it works to kill fleas in all stages of development. This way, you will surely get the best flea medication for dogs that will relieve your dog’s itchiness and make it happy and healthy again. 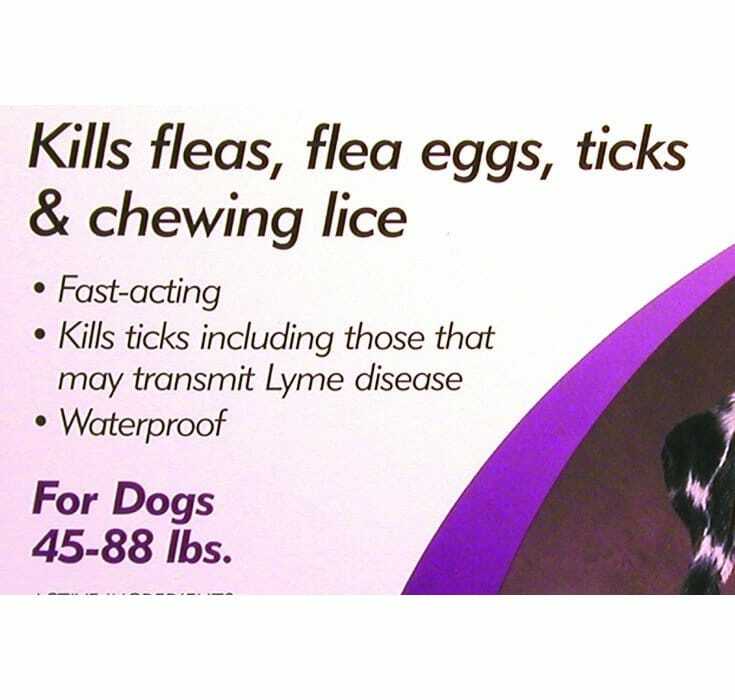 Buying medicine that works against fleas is great, but what if your dog is affected by lice and ticks, too? Getting different treatments for all these critters may not be a good idea because you run the risk of overmedicating your dog, and that is not an option any responsible pet owner should consider. The most effective treatments on the market are those that are intended for treating multiple problems, including fleas, ticks, and lice. Some formulas go as far as repelling flies and mosquitoes that are known for being carriers for the eggs of these critters. Fleas and ticks are, in turn, carriers of dangerous diseases, such as the Lyme disease, so, by protecting your dog against them, you are protecting your entire family against getting ill. Such things should not be taken lightly, and that means that the best flea medicine is the type that also protects your dog against all kinds of pests like the ones mentioned above. Another thing you will be interested in is the method of delivery used. Here, everything depends on what method you think it is best for your dog and your preferences. For instance, topical solutions are quite widespread, because they are easy to use and they ensure prevention as you use them regularly on your dog. You can even administer your dog oral treatments for the critters mentioned in this buying guide. The best oral flea medication for dogs should be just as good as the rest of the medicine available, and just as efficient. After all, this is the most important criterion that matters. You can use shampoos, wipes, and spot-ons with maximum efficiency. There are plenty of products available for sale, and you should just pick one that works for your lifestyle. Collars are another option that is non-invasive and works for many months. Nonetheless, if you’re keen on giving your dog tablets, instead, you will identify the best oral flea medication with the help of these recommendations.